Stereoscopic techniques can be traced in avant-garde practices going back to Dada, which then carried over into the work of Oskar Fischinger, Norman McLaren, and eventually Ken Jacobs, but Godard’s 3D compositions have such a magisterial grace that it can feel as though we’re seeing all three dimensions with our own eyes for the first time. Evenly distributed throughout Adieu’s duration, Godard inserts one coup de cinéma after another: trick shots, clashing overlays, warped 2D images, stereoscopic fields that divide (then reunite), and disorienting deep-focus compositions all spill over the screen as illusions of depth compulsively emerge and recede. Dutch angles create the impression that figures and objects might slide out of the frame at any moment, while an upside-down shot of a car screeching to a halt is as gravity-defying as anything in Cuarón’s 3D outer-space blockbuster. And as in Film Socialisme (2010), the sound mix repeatedly calls attention to its own stereophonic falsehoods via peaking bursts of music, dialogue, and ambient noise segregated into either the left or right channel. (The sound design is so accommodating to disruptions that audience members’ cell-phone rings were generally believed to have been part of the film.) These devices are cut with enough extended spells of sublimity and beauty that the optical and sonic barrages never become intolerably abrasive. It’s a strategy meant to resist any of the “total cinema” delusions so often affiliated with cinematic stereoscopic technology, and to preclude the onset of complacency or passivity in the spectator. This perhaps paints Adieu au langage to be far more of an “exercise,” but make no mistake: it’s wholly structured around thought and emotion, and is teeming with a sorrow and anger that may only rise after the lights go up and the glasses come off. 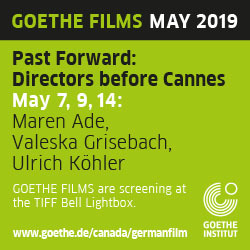 It is tempting to list it among Godard’s string of late-career film-essays, but this designation would indicate a far more cerebral viewing experience than the film offers. The onslaught of quotations, citations, and references to world events might suggest otherwise, but Godard is too attuned to the way the mind consumes and organizes information—especially dense philosophical information—to legitimately expect his audience to locate a fully developed thesis and argument from these waves of metaphors and allusions. This is demonstrated early on when, upon mentioning Vladimir K. Zworykin’s invention of television, he cheekily asks, “1933, does that ring a bell?” and then reminds us that it was also the year Hitler was elected. It’s as cynical a technological history as you can get, but it’s also an instruction on how to process the data he’s heaving at us. It will all “ring a bell,” but the extent to which the reverberations can fully manifest themselves in our consciousness before the next (often contradictory) element is thrust upon us is duly left open. This perverse strategy asks us to do away with interpretation—to bid farewell to cognition, offer a “so long” to translation, and say goodbye to language—while demanding that we simultaneously listen, read, and process information constantly. 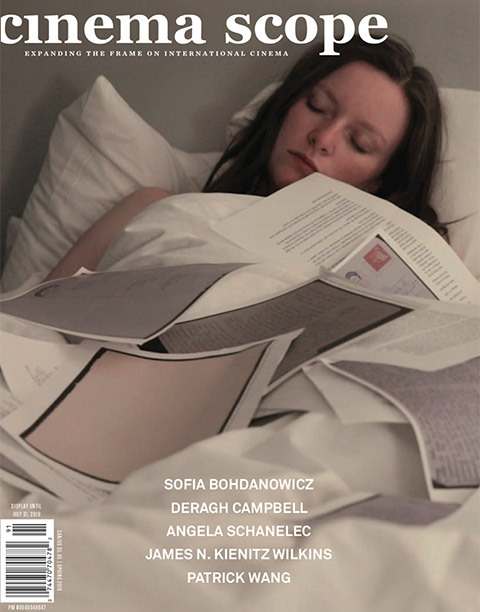 Evoking a sizable range of cultural and semantics theorists, as well as exhibiting a certain allegiance to the Lacanian Real (an allegiance Godard would likely never admit to), Adieu au langage is a lashing out against the symbolic and semiotic structures that hinder our ability to experience truth in the world, and laments the freedoms lost from so many demarcations and hierarchies, while painfully acknowledging the impossibility of the world without them. Abstraction is the closest we can get to reality, and he locates this utopian order-outside-of-order in three creative fields: geometry as an abstraction of space (viz. Laurent Schwartz, the Dirac delta function, and Riemann landscapes); poetic literature as an abstraction of syntax (viz. Rilke and Dostoevsky); and Impressionism and Fauvism as abstractions of the pictorial (viz. his trademark hyper-saturated colour palette, Monet and de Staël quotations, and countless shots of landscapes through windshield wiper blades fighting off every season’s variety of precipitation). Adieu au langage, finally, is Godard’s harrowing attempt to employ 3D imagemaking as an abstraction of reality; to use metaphor as a passageway into nature. Which brings us to the dog. 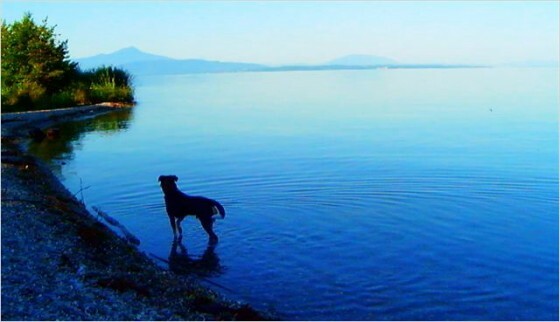 Portrayed by Godard’s own loyal canine, Roxy, the film’s hero spends most of his time onscreen either frolicking in and around a river, napping on a couch, or wandering through a forest (a.k.a. “the world,” as the Chikawa tribe sees no point in distinguishing between the two). He is “not naked, because he is always naked,” and he—like the rest of his species—“will love you more than he loves himself.” Free in the world yet beholden to man’s command, he is blissfully oblivious to whatever morals there are declaring it okay for him to be chained up in public and barred from entering certain rooms of the house. He, like every other animal, cannot see war, while man reduces to a state where he needs an interpreter for the words coming out of his own mouth, staring into the clouds and seeing images of dogs. “In the blue or the white?” asks someone, for some reason. It’s not just that Roxy exudes an uncanny degree of dignity in his basic canine activities that makes him such an instantly iconic screen hero; it’s also that every functional and intelligent human subject that he shares the screen with appears, by comparison, to be so pathetically alone yet devoid of autonomy. A few have called Adieu au langage one of Godard’s most optimistic films, but there can’t be many ideas in his oeuvre more damning than that of a grown man and woman looking down at a sleeping dog and wondering if he’s dreaming of the Marquesas Islands, a notion only double-underscored by the subsequent sound of competing howls and babble—likely the most satisfying and deeply moving duet in cinema history. Cannes 2014 | Jauja (Lisandro Alonso, Argentina/Mexico/Denmark/France/Germany/USA/Brazil) Cannes 2014: Who Let the Dogs Out?